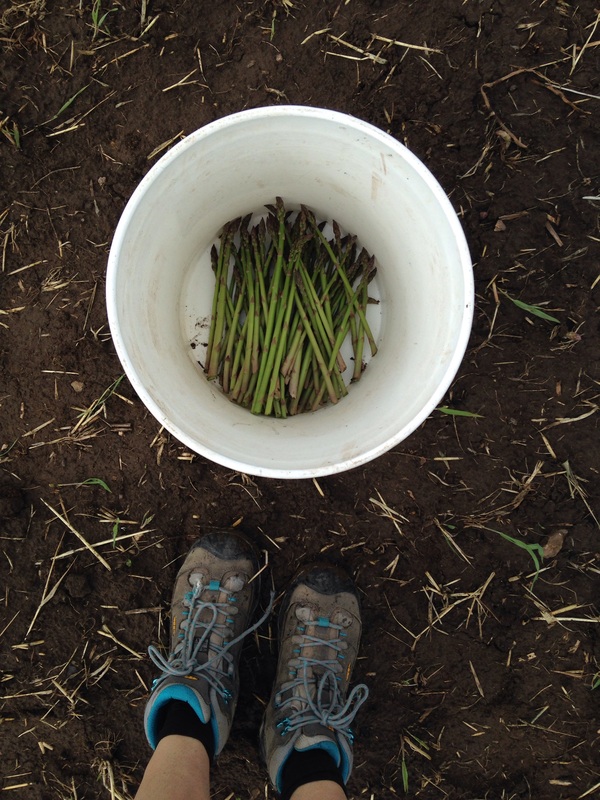 I have been asparagus-ing like crazy these last few weeks. Oh, asparagus is not a verb? Well you could have fooled me because suddenly my whole life seems to revolve around asparagus. We harvest from a small pick-your-own farm on Monday and deliver it to our restaurants in Madison on Tuesday and an even more local restaurant on Wednesday. We harvest the tender, green and purple spears from our small home patch for ourselves whenever we can and cook it up almost in some which way or another practically every day. With all the eating and the picking and the selling and devouring, I’ve completely neglected to tell you about any of it. Here is what I offer to you as a most heart-felt apology: 25 ways to asparagus!! 1. Roast it like this. 2. Roast it like that. 3. Roast it just about any way you can think of. 4. Make it into a hash. 5. Shave it onto pizza. 7. No really. She does. 8. Plop it on top of polenta. 11. Or blanch it and freeze it for later soup. 14. Chop it up, sauté it and toss it into a quiche with pork sausage, scallions and Parmesan. 15. Do that at least 5 more times. 16. Put it in a tart. Which yes, is different than a quiche. 17. Add it to your morning Benedict. Sub it for either the English muffin or the Canadian bacon. 18. Is it possible I have forgotten salads!? Put it in this salad. 20. Or cook up some quinoa, chop up some roasted asparagus and invent your own salad. 21. Stick it in a spring roll. 22. Stick it in some sushi. 22. Tempura batter and fry it. 24. Tempura batter and fry it and stick it in some sushi. 25. Make the most recent Leek creation! 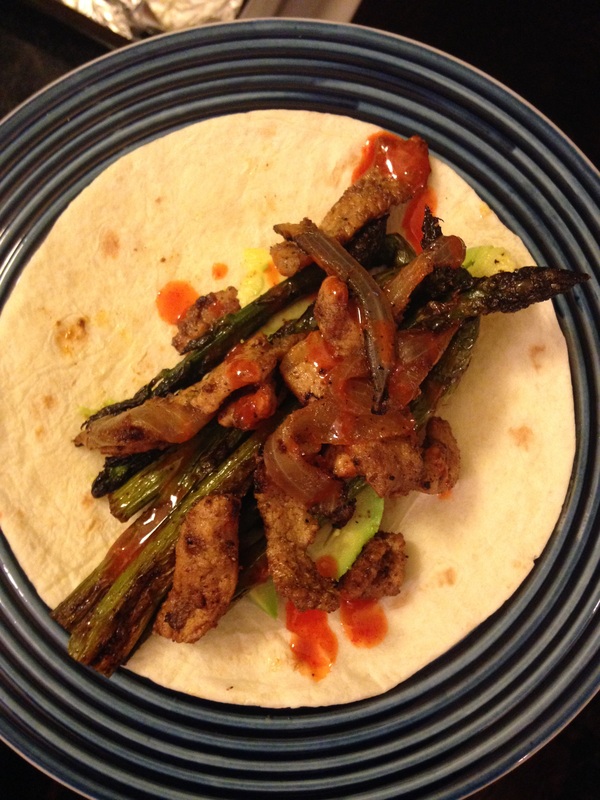 Chili-roasted asparagus fajitas (below) because oh my god they’re so good!!! We buy a half pig from my parents every 6 months which leaves us with lots and lots of ham steaks, but these are not something super common in the grocery store. If you don’t have a ham steak, feel free to sub in beef or chicken. Remove tough ends from asparagus and halve (lenth-wise) any thicker pieces. Toss asparagus on a baking sheet with olive oil, 1 teaspoon chili powder, 1/2 teaspoon Kosher salt and a generous dusting of freshly ground black pepper. Roast for 20 minutes, stopping at 10 minutes to toss for evening “charring”. Prepare ham steak by cutting into verythin slices no longer than 2 inches. Heat vegetable oil in a large heavy skillet (preferably cast-iron) over medium high heat. Once oil is hot, add meat and onions. Cook for 5 minutes, stirring pretty much constantly to keep things moving and cooking evenly. Things should be sizzling and cooking quickly. There might even be smoke, but don’t turn down the heat. Fajitas should have a nice sizzle while they cook. Add cumin, garlic powder, remaining teaspoon chili powder, cinnamon, cayenne and a good sprinkling of Kosher salt and freshly ground black pepper. Cook 5 minutes longer or until onions are cooked to your liking. Taste and adjust seasonings. 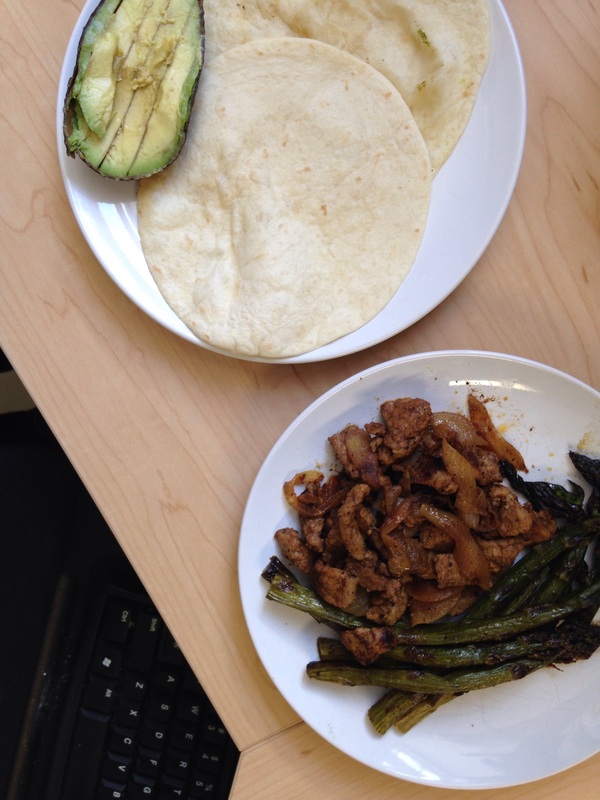 Build your fajita in a small corn or flour tortilla. We put asparagus in the tortilla first, followed by pork and onions and then topped with avocado, sour cream and hot sauce. These elements, though optional, are a must if you have them on hand. and don’t forget, it’s a fresh (not smoked or cured) ham steak. Pork shoulder could also work. Both (unlike the loin) have lots of flavor. It sounds delicious!